Along with following Facebook’s own Messenger marketing rules, these guidelines will help you get high engagement and avoid complaints. The potential risk of not following Facebook’s rules would be for too many people hit the “report” button and give your Facebook bot a high block rate. Real-world cautionary tale of a high block rate here. 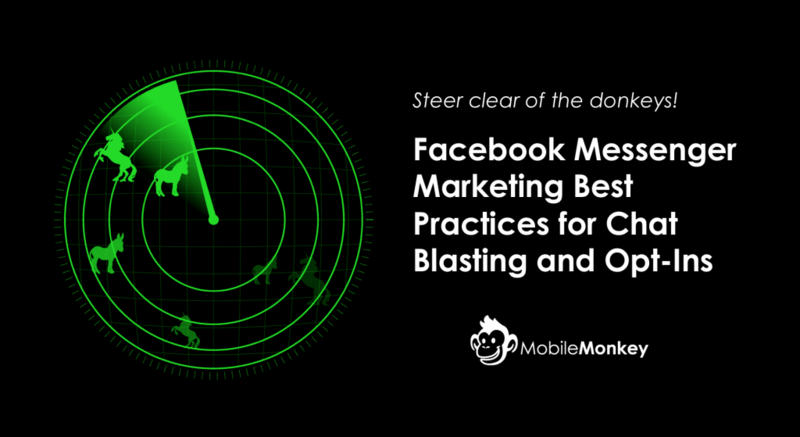 Facebook Messenger marketing and Facebook broadcasting or chat blasting is new technology. Your mistakes become your discoveries at this stage of the game. 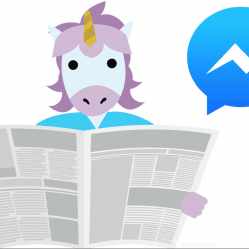 This guide to Facebook Messenger Marketing best practices includes all unicorn successes and donkey flops learned from my personal experience. So what’s Facebook’s official rule on the Facebook post comment autoresponder and how someone’s opted in to messaging? If someone messages your post, you can send one (just one) quick reply. This doesn’t mean they have opted in to receiving messaging. In order to opt into messaging they need to message your chatbot. So say they’ve messaged your post via a comment and you respond using the “one free reply” with a post autoresponder. Only if they respond to your message will they have opted in to messaging. Now here’s the unicorn opt-in tactic. One thing you should do in your initial reply is to try to encourage a response. In your one free reply, ask them a dead-simple question. “Would you like to know the answer to the riddle? Type YES to proceed”. Once they respond “yes,” they’re officially opted into messaging. Don’t waste your one free reply on a donkey, like giving away an offer or answer without first getting them to interact with you. 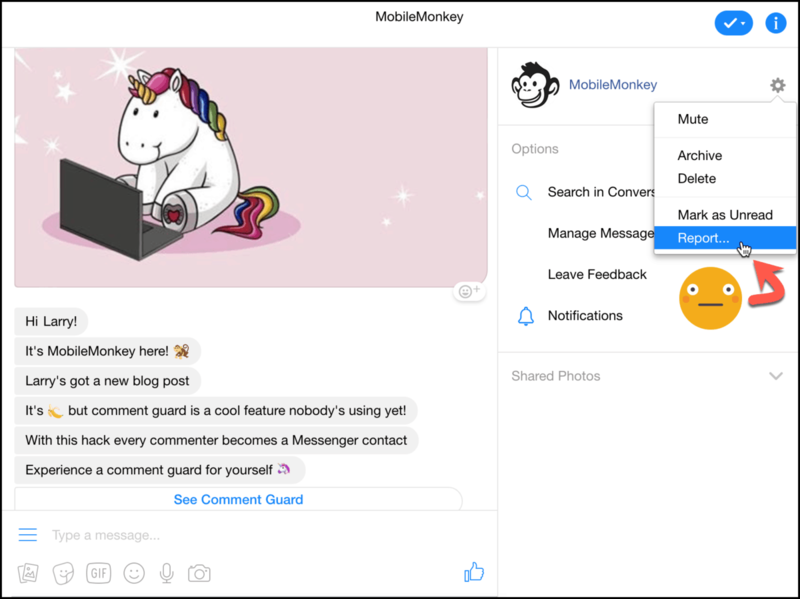 When it comes to chat blasting, or bulk sending messages, Facebook has set certain limitation around the content that you’re sending. And there are things you should do because they’ll help you keep engagement and user satisfaction high. 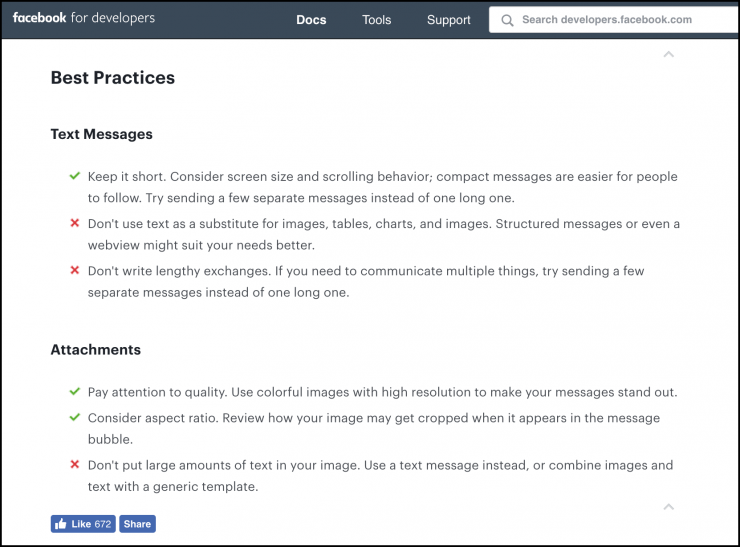 Maybe you noticed that a lot of the tips people use in email marketing to reduce complaints and confusion are the same in chat. So this one probably rings a bell. When you’ve got a new list, like sign-ups from a webinar, you send an email blast about the webinar so next time you email them, they remember that you got their contact info from that event. They won’t be surprised when they get your message later. Same thing applies in Messenger marketing. Make a warm introduction to your new contacts with a quick welcome blast, confirmation sequence, or drip campaign. 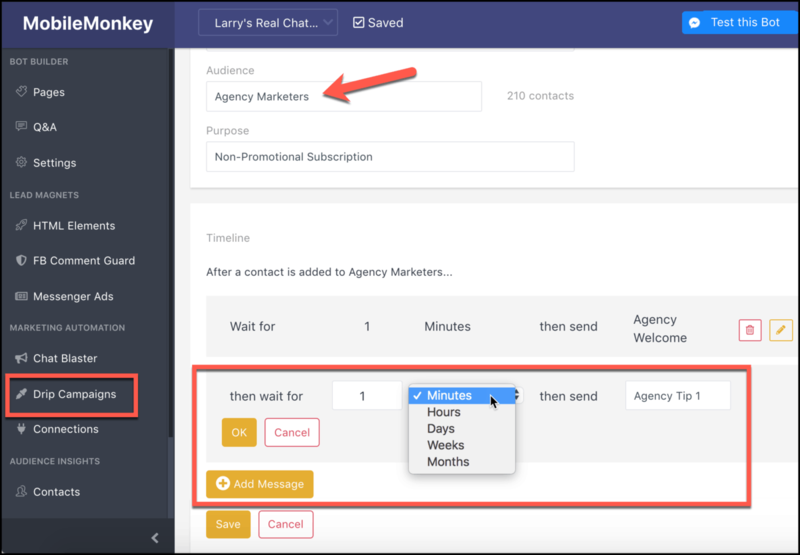 Messenger drip campaigns: Welcome new audience members to your brand and content, then follow up throughout the day and week with valuable and relevant content delivered on a schedule. 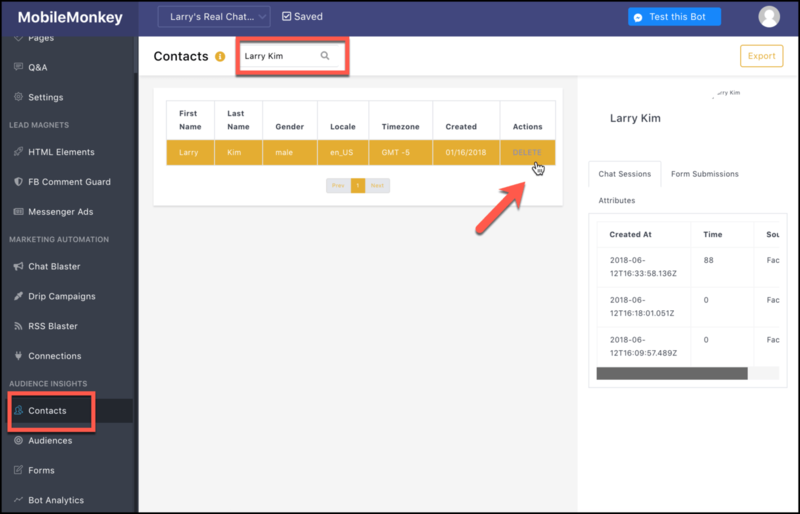 Welcome blast: If it makes more sense to send a one-off welcome blast to an audience segment rather than setting up a drip campaign to a dynamic audience, just use the chat blaster to say hi and welcome them after an event or signup. Confirmation message: Request that a new contact confirms they’re interest in your updates with one or two short messages. This is like an opt-in confirmation in email. One of the biggest donkey moves that can happen in chat marketing is when people are opted-in through clandestine ways and then are caught off-guard when you message them later. Mitigate opt-in confusion with a drip campaign, welcome or confirmation message right away. There’s no Facebook policy that says you have to let people know they can unsubscribe at any time. But not including an explicit “unsubscribe” note at the end of my blast a few weeks ago is what put me in the donkey shed with Facebook. 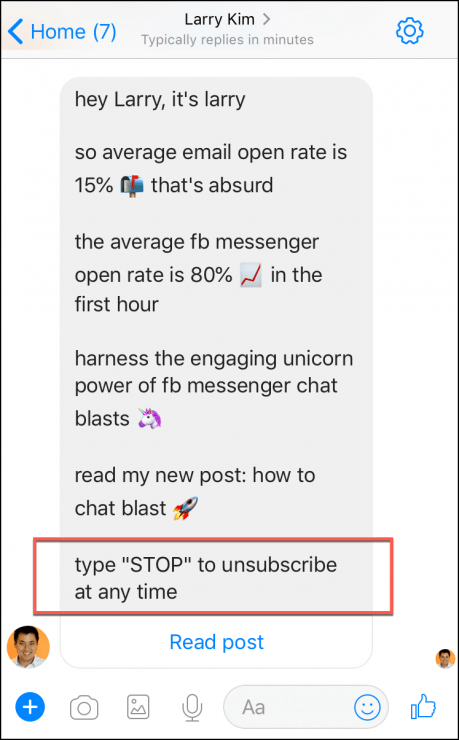 When someone type “stop” or “unsubscribe”, MobileMonkey handles opt-outs automatically. Trust me, you’ll avoid reports to Facebook and complaints from your subscribers. Sometimes people may want you to remove them from list and rather than typing “stop” or “unsubscribe” to the bot, they send you a message on another channel. It’s easy to oblige and manually delete users from the contacts tab in MobileMonkey. To protect against accidental deletions, you’ll have to verify that you want to remove them. 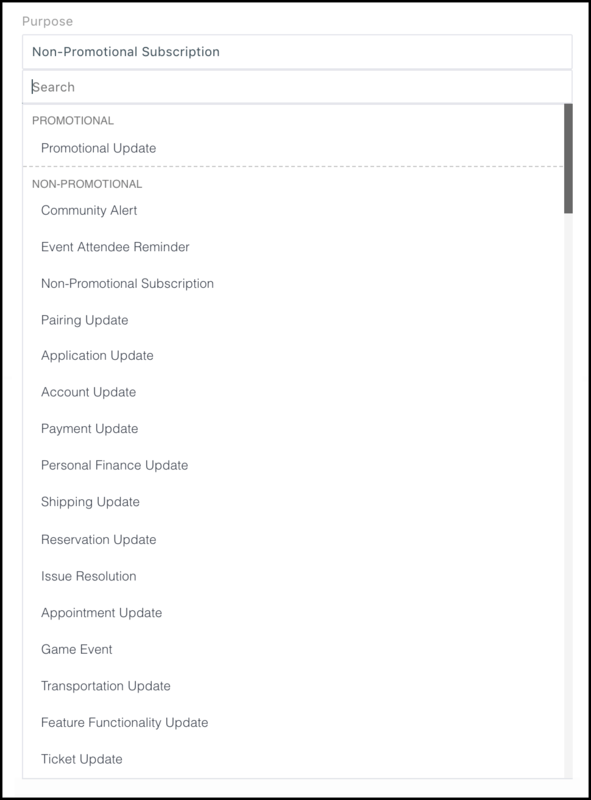 If you’re sending promotional updates to your contacts, follow the 24+1 Rule. In the first 24 hours of a user opting in to messaging, you can send as much promotional or non-promotional stuff as you want. After 24 hours are up, you can send as much non-promotional stuff as you want, and one promotional follow up. This is the 24+1 Rule. 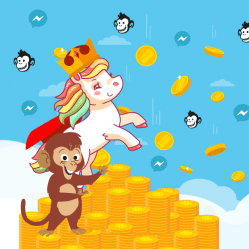 So how do you do Facebook Messenger marketing without being promotional on chat? That’s the beauty of engagement. If someone engages with your non-promotional content by replying to your bot, that resets the clock! 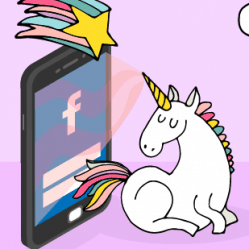 The unicorn that’s always in your sights is providing an engaging experience. You’re allowed unlimited promotional content for another 24 hours when you’ve experienced an engagement with your contacts. Facebook suggests keeping messages short, and separating long messages into a few shorter messages. Just keep in mind, that your subscribers will get a ping for every message you send. Avoid blowing up their phone with notifications with a machine-gun blast of messages. 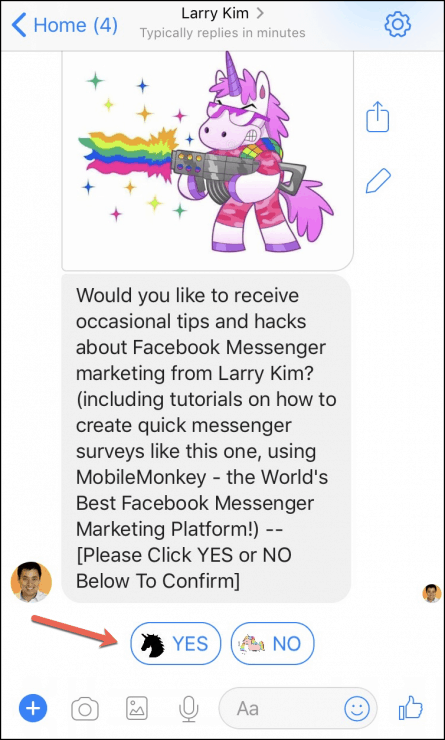 Moral of the story, follow Facebook’s Messenger rules, make opt-in explicit and make opt-out easy to keep Facebook and your subscribers happy. And as always, say “no” to donkeys and “yes” to unicorns. 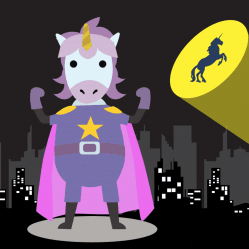 What hard-earned donkeys or clone-worthy unicorns have you observed in your own Facebook Messenger Marketing? We’d love to hear in the comments! This was a great article! Thanks for keeping me out of Bot Jail!